← English pie in our Wilmo!!!!! Finally after more than one year that i wanted to try it, a friend of mine from Italy brought me to Gaucho. He loves meat and remembering some bad experience he had in London, i suggested him to go there: everyone knows is a good restaurant, a bit expensive but the meat it’s really worth the money!!!! So we went in the one in Piccadilly and it ‘s a really nice place to stay: on three floors, with candles lights and a horse printed style everywhere, you will have an amazing service, with your personal waitress explaining the meat cut, suggesting and taking care of you! Our waitress was brazilian, but she was speaking and amazing italian too and was really funny and professional. Arriving at the table you will find already a little starter with normal bread, butter, a typical sauce but, the thing i loved the most was a little cheese bread too good to leave it there. 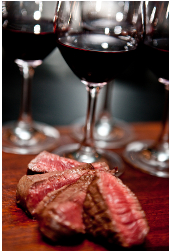 After it, we ordered some red wine and the meat. Between all the different cut and types of cut, i choose a fillet of 250gr (the smallest) and i also asked for a special side order “humitas”, made of mashed corn. The meat was just delicious and they bring you that with 4 different sauces: mushrooms, mustard, something like peppercorn gravy and the best one, a Bernaise sauce. Of course i don’t know the name of that and all the ingredients in those, but they were all very good! The mashed corn had a really particular taste, never tried before and it was served in 2 little portions , rolled in corn husks. Really tasty and beautifully presented. Of course there was the possibility to try also some nice looking dessert, but i prefered to have just a coffee to close the meal. Maybe next time…. 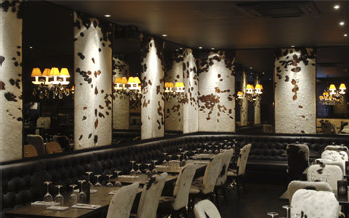 So for a gooood meat in London, go safe with Gaucho! PS. Mamy con un mio amico di passaggio a Londra e che va pazzo per la carne, siamo andati in una catena di ristornati argentini qui a Londra…non ti dico che carne che fanno. Un po’ costoso il posto, ma ne valeva proprio la pena. Ho mangiato un filetto che si scioglieva in bocca e poi ce l’hanno portato con delle salsine ed un contorno di puree di mais particolarissimo! This entry was posted in Eating out and tagged argentinian, cheese bread, gaucho, mashed corn, meat, piccadilly, restaurant. Bookmark the permalink.